North Carolina students will be pleased to know that they may be eligible for a few specific financing and assistance programs offered the state itself and its associated partners. The state is home to 16 UNC system universities, 36 private colleges, and 58 community colleges, so there is a diverse array of options. The North Carolina State Education Assistance Authority will be a great help to you throughout your financial aid journey as a college-bound student in the region. 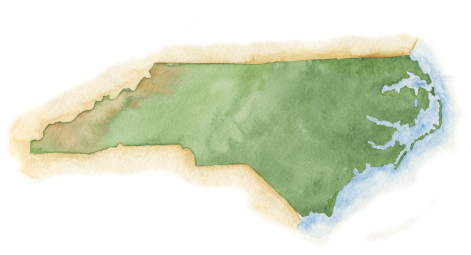 Not only does the website act as a hub for articles, tips, and information on everything from state colleges to student loans to interest calculation, the NCSEAA will point you in the direction of the College Foundation of North Carolina. College Foundation, Inc. is a loan servicing company that manages loan programs and accounts for North Carolina students. CFNC will undoubtedly act as your one-stop-shop for everything related to student loans in the state, as well as valuable information about scholarships, grants, applying for college, and planning your education and payment. College students in North Carolina are no different from others across the country: most must carry multiple student loans, sometimes including a mix of private and federal funds. However, you will be interested in being aware of those special opportunities only available to North Carolina students, such as the Carolina Computing Initiative and resources from CFNC that can help you manage and obtain your federal loans. The College Foundation of North Carolina makes student loans as easy for you to understand as possible. Their clean and well-organized website offers easy online applications, a place for you to setup affordable payment plans, tools that allow you to manage your account and even some nifty loan calculators so you know exactly how much money you owe. Prior to 2010 when there was a major shift from state-funded loan programs to federal, CFNC made federal loans. While they still manage these loans online, they no longer offer them to new borrowers. They do, however, give tips and strategies that those considering private, or alternative, loans will want to remember. They also offer information on direct student loans and direct consolidated loans originated by the federal government. The North Carolina EXTRA Educational Loan was a member of the NC Family Education Loan Program prior to 2010, however, CFNC has had to suspend the loan program to cope with changes in the federal government’s loan policy. Of course, CFNC will still maintain your loan progress if you have an old EXTRA loan from before 2010. If you are student at the well-renowned state university UNC – Chapel Hill, you may qualify for a student grant through the Carolina Computing Initiative (CCI) that makes it more financially possible for you to afford paying for a laptop computer that runs well and will improve the efficiency of you college experience greatly. Now that nearly all students have made the move laptop computers and desktops are fairly obsolete in the classroom, a CCI fund may make it more financially palatable with less shock to the financial system. Laptops that comply with CCI standards are increasingly essential and certainly suit a college student’s lifestyle in their mobility. CCI computers must be bought with the grant through the UNC-Chapel Hill bookstore. Laptop grants are given to incoming students at UNC who demonstrate need and desire. Professionals in math and science, according to recent statistics, are not plentiful enough in North Carolina in comparison to other parts of the world. The new world order demands necessary new world professionals and NC wants to keep them within state boundaries if it can. In recent years, more and more states are working harder to avoid losing their college graduates to other more attractive destinations. Certain essential professional fields are severely lacking in key locations, and for this reason monetary incentives like career-specific student loans have become de rigueur. North Carolina needs dedicated and well-trained health professionals, educators and students pursuing careers in science or math. Eligible applicants for a career-specific loan in nursing, teaching, or health, science, and mathematics, may earn amounts equal to the cost of their tuition. The good part is, though, that those recipients, who agree to work in the state, may receive full loan waivers in return for their service. This means you don’t have to repay the loan. Students enrolled in applicable Associates, Bachelors, Masters and Ph.D. programs may apply and be approved for between $2,000 and $8,500 for each academic year in this special state program. One other program unique to North Carolina that you may be interested in is the College eLearning initiative, which provides access to many of the state’s 100+ higher learning institutions without ever leaving the comfort of your home. Students who go through this program to receive their education may attend classes at a North Carolina training or technical institute, at a UNC-system school, or at a private NC college. Loans may also be used to these attend distance-learning courses, making high-quality education affordable and practical for every student in North Carolina willing to get started on applying, regardless of their location, transportation, or finances.